MARCH 25, 2014 — Patrick Novecosky, editor of this blog and Editor-in-Chief of Legatus magazine, was a guest on Iowa Catholic Radio in Des Moines, Iowa, this morning. 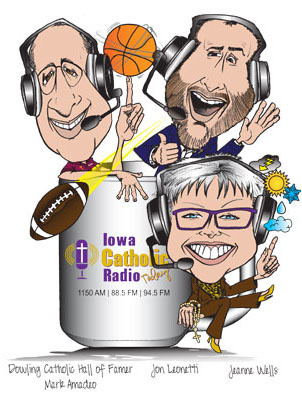 He appeared on the Iowa Catholic Radio TODAY with Mark Reed (Director of Institutional Advancement at Catholic Foundation of Southwest Iowa), Mark Amadeo, Jeanne Wells, and Fr. Joe Pins (Vocations Director for the Diocese of Des Moines). They asked Novecosky about Legatus and its members, CEOs and business leaders who strive to become better Catholics by meeting once a month for rosary, Confession, Mass, and a good speaker. The conversation then turned to Pope Francis’ announcement of 24-hours-for-the-Lord, happening in Rome this weekend. Basilicas in Rome will be open for Confession and Eucharistic adoration. More importantly, they discussed the need for Catholics to return to regular Confession during Lent in order that they may experience more of the Lord’s mercy. TOP: Chris Stewart (left) and Tony Brandt are the hosts of Casting Nets. 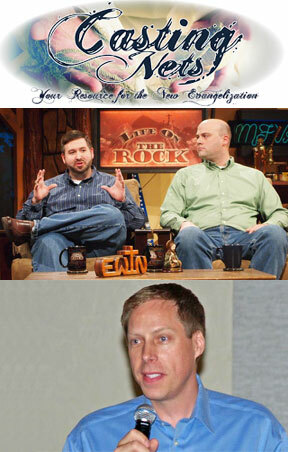 BOTTOM: They interviewed Patrick Novecosky on their July 12 program. JULY 12, 2013 — Patrick Novecosky, editor of this blog and editor-in-chief of Legatus magazine, was a guest on the Casting Nets radio program today. 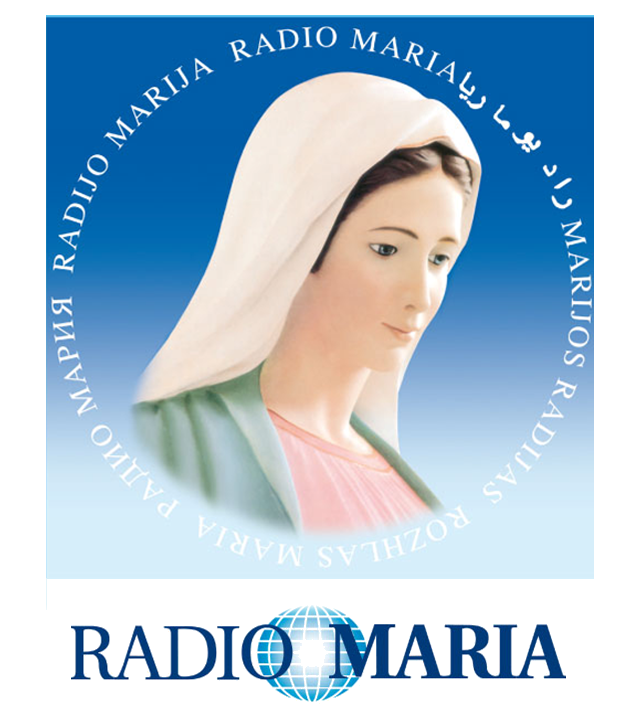 The hour-long interview with hosts Tony Brandt and Chris Stewart touched on the work of Legatus, the membership organization of Catholic executives founded in 1987 by Tom Monaghan who also founded Domino’s Pizza and Ave Maria University. Legatus exists to help Catholic presidents and CEOs learn, live and spread their faith. The hosts also asked Novecosky about the need for greater evangelization and catechesis in the Catholic Church, especially among business leaders. Casting Nets Ministries, a non-profit lay apostolate, dedicated to the challenge of the New Evangelization. Click here to listen to the entire interview. JUNE 24, 2013 — Patrick Novecosky, editor of this blog and editor-in-chief of Legatus magazine, was a guest on Iowa Catholic Radio in Des Moines, Iowa, this morning. He appeared on the Iowa Catholic Radio Morning Show with Jon Leonetti and Jeanne Wells. They asked Patrick about his four meetings with Pope John Paul II and what it was like to be in the presence of a living saint. 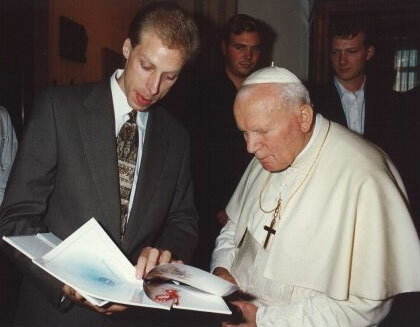 Patrick described his first encounter with the Pope on Oct. 1, 1997, in the Papal Apartments at the Vatican. They also discussed news reports (TIME.com, National Post) of a “shocking” miraculous cure through the intercession of Blessed Pope John Paul II,which would lead to his canonization in October — a mere eight-and-a-half years after his death. The fastest canonization in modern history currently belongs to St. Josemaría Escrivá, the founder of Opus Dei, who became a saint 27 years after his death. Listen to the full interview by clicking here. 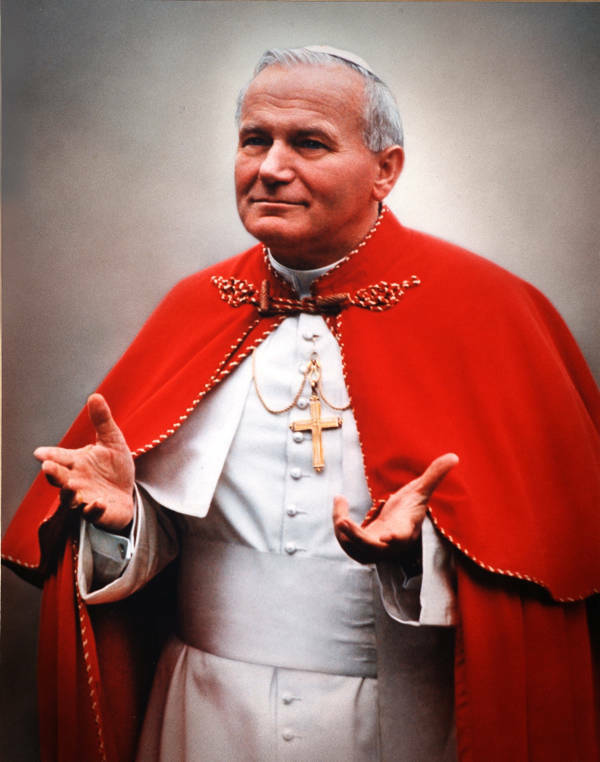 Pope St. John Paul II canonization in October? APRIL 29, 2013 — Patrick Novecosky, editor of this blog and editor-in-chief of Legatus magazine, was a guest on Iowa Catholic Radio in Des Moines, Iowa, this morning. 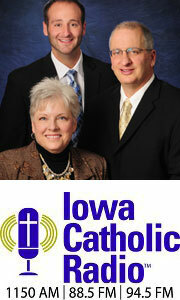 He appeared on the Iowa Catholic Radio Morning Show with Jeanne Wells and Dowling Catholic Hall of Famer Mark Amadeo. They asked Patrick about blog and social media reports that Blessed Pope John Paul II will be canonized in October — a mere eight-and-a-half years after his death. A week ago, Vatican insider Andrea Tornielli published an article in the Italian newspaper La Stampa saying that Vatican’s medical council charged with reviewing a possible miraculous healing attributable to John Paul II has ruled it “inexplicable” and has forwarded the file to the Vatican Congregation for the Saints for further study. 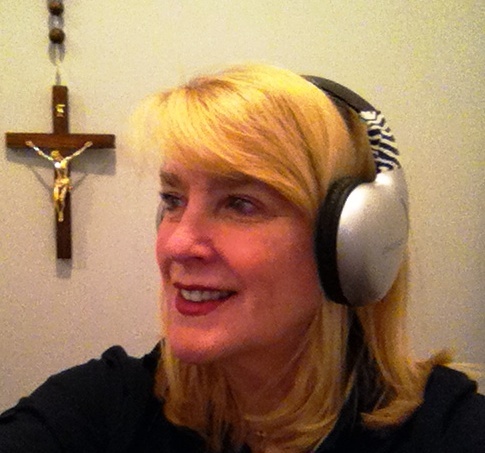 VANCOUVER, Canada (April 1, 2013) — I was a guest on Radio Maria’s The Bible Lady with Gail Buckley this morning. I had just arrived in Vancouver an hour before getting on the phone with her, so I was a little jet-lagged. We talked about faith, family and Francis — the Pope, that is. She asked me about my time in Rome during the conclave and the first days of Pope Francis’ pontificate. My posts on the conclave and the new pope are published here on this site. Just click on the HOME button at the top and scroll down to access those blog posts, radio and television interviews. We both marveled at the new pope’s humility. Gail also asked me about Legatus, the organization I work for. My interview starts around 11 minutes 30 seconds. Click here to listen to the entire interview. It had been nearly 600 years since a successor of St. Peter resigned from his post. After months of reflection and prayer, Pope Benedict XVI became the third pope in the last 1,000 years to resign from the Chair of Peter. The Feb. 11 announcement that shook the world has now given way to speculation as to who will become the 266th successor of St. Peter. The 115 cardinals who will choose the next pope (including 11 Americans and three Canadians) have already begun to assemble in Rome for meetings, prayer and discernment. Their pre-conclave meetings have drawn the world’s attention. While the surprise announcement took everyone by surprise, Pope Benedict gave several hints at his decision that most Vatican-watchers missed or dismissed. On April 29, 2009, Pope Benedict stopped in Aquila, Italy, and visited the tomb of an obscure medieval pope named St. Celestine V (1215-1296). After a brief prayer, he left his pallium, the symbol of his episcopal authority as bishop of Rome, on Celestine’s tomb. 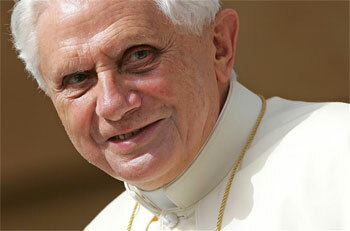 Pope Benedict also indicated his inclination to step down in an interview with German papal biographer Peter Seewald. The writer told German magazine Focus that when he met with the Pope in December, he appeared to have lost vision in one eye, was losing his hearing and looked emaciated. 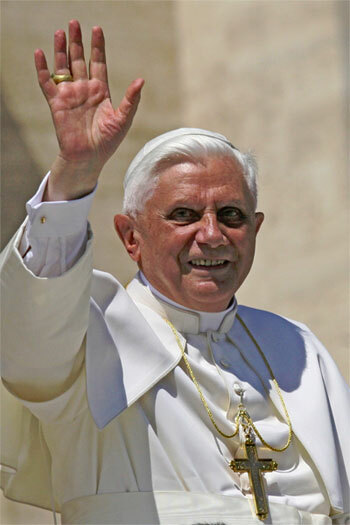 Pope Benedict acknowledged his impending retirement during his first public appearance after the announcement. “I did this in full freedom for the good of the Church, after having prayed at length and having examined my conscience before God, well aware of the seriousness of the act, but equally conscious of no longer being able to carry out the Petrine ministry with the strength that it requires,” he said during his Feb. 13 general audience. 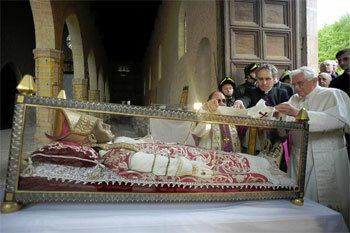 The resignation became official on Feb. 28 when the Pope left the Vatican for his summer residence at Castel Gandolfo. He will live there until remodeling work is completed on the Mater Ecclesiae Monastery in the Vatican Gardens. In his Feb. 14 address to thousands of priests from the diocese of Rome, in what turned out to be a farewell address in his capacity as their bishop, the Holy Father described his retirement plans. “Even if I am withdrawing into prayer, I will always be close to all of you, and I am sure that you will be close to me, even if I remain hidden to the world,” he said in his mostly extemporaneous remarks. Smoke belches from the chimney erected on the roof of the Sistine Chapel. White smoke means a Pope has been elected. Black smoke indicates no decision. According to current rules, established by Blessed John Paul II, a period of sede vacante (Latin for “empty seat”) follows a pope’s death or resignation. A conclave of papal electors (cardinals in good standing under the age of 80) must convene between 15-20 days after the Chair of Peter is vacated. Benedict altered those rules, allowing cardinals to shorten the length of the sede vacante. Earlier today, they voted to begin the conclave on Tuesday evening, March 12. Presiding over the conclave will be the most senior cardinal-bishop under age 80, Cardinal Giovanni Battista Re. Two secret ballots are held each morning and two each afternoon in the Sistine Chapel. A two-thirds majority is required. Ballots are burned after each round. 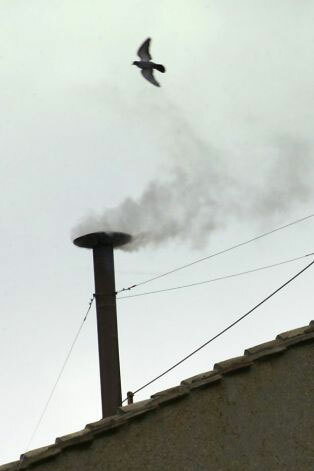 Black smoke means no decision; white smoke signals that cardinals have chosen a pope and he has accepted. Bells also signal the election of a pope to help avoid possible confusion over the color of smoke coming from chimney of the Sistine Chapel. The presiding cardinal, if not elected himself, is charged with asking the elected candidate to accept the papacy. If the candidate accepts election, the presiding cardinal will ask what the new pope’s name will be. The cardinals may elect any baptized Catholic male, but since 1389, they have always elected a fellow cardinal. PATRICK NOVECOSKY is the editor of Legatus magazine. He will be in Rome to for the conclave to elect the next pope. This article appears in the March issue of that publication. My hat’s off to him. Pope Benedict XVI sure knows how to make headlines. His Feb. 11 announcement that he would step down as the Church’s 265th successor of St. Peter was heard around the world. The Pope’s decision took many by surprise — including New York Cardinal Timothy Dolan who said he was “startled” by the news. But after some reflection, many Vatican-watchers said they had noticed the Holy Father’s decline in energy and his loss of weight over the last couple of months — two of the reasons Benedict gave for stepping aside. On Thursday evening, the Church will enter a period of sede vacante (Latin for “the seat being vacant”). It’s a time of prayer and reflection — prayer of thanksgiving for Benedict’s papacy and prayer for his successor. A time also for reflecting on what Benedict taught us. One thing I’ve pondered is the remarkable complementarity between Blessed John Paul II and Benedict. One was a philosopher and poet, the other a theologian and teacher. One an extrovert, the other an introvert. Effortlessly charismatic, John Paul was a natural communicator. Benedict, on the other hand, didn’t shrink from the spotlight, but he didn’t crave it either. While the two men may have differed in temperament and personality, they were of one mind and one voice when it came to proclaiming the Gospel and the teachings of the Church. Benedict was the natural successor to the man who unpacked and implemented the teachings of the Second Vatican Council. John Paul gave us the new evangelization and Benedict gave it shape and substance — then made it one of the Church’s top priorities in the West. In the final months of John Paul’s life, he gave serious thought to stepping down. After prayer and reflection, he opted to live out his final days publicly. Who can forget his Easter Sunday 2005 appearance at the window of the papal apartments? Aides had readied a microphone, and he tried to utter a few words but was unable to speak. While John Paul the extrovert showed us how to die with grace, Benedict the introvert taught us a lesson in surrendering, of not clinging to power and things of the world. This prayerful servant of God knew it was time to hand the Keys of Peter to a younger man. Now let’s beg the Holy Spirit for his guidance for the next Vicar of Christ. PATRICK NOVECOSKY is Legatus magazine’s editor-in-chief. He will be in Rome to report on the conclave to elect a new pope. This article appears in the March issue of Legatus magazine.